Superliner Gel Intenza 36H waterproof – 36H long hold waterproof eyeliner, intense color result, intense line, dramatic eye look. 36H long wear, waterproof, smudge proof, resists sweat, tears and sebum. Super smooth gel texture, easy gliding on eyes, super long stay makeup result. Easy to use, quick dry formula, perfect application with the high precision brush. Easy to remove with eye makeup remover. Dip Tip of Gel Intenza Eyeliner brush into formula and tissue of excess, now apply in delicate strokes and glide liner across lash line from inner to outer corner. Extend thicken line and wing out for more intensity. The eyeliner comes in such a pretty packaging, it is a cute small gloss container with a screw open golden colour lid. It is tiny in size so you can carry it with you anywhere and the another advantage is every eyeliner has its own eyeliner application brush, so you no need to carry a separate brush or makeup things to achieve a perfect eye line. The texture of the eye liner is so soft and silky smooth to glide on the eyes, It never stuck on your eyes. The pigmentation!!! There is no doubt, it has absolutely stunning pigmentation that you will like it to the core. The colour of the shades is showing very well on the eyes when applied. 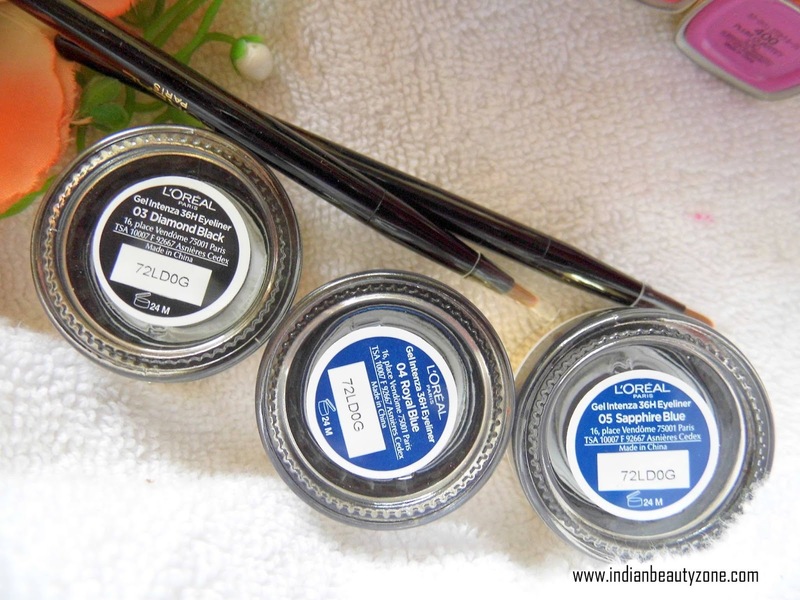 I am reviewing Diamond Black, Royal Blue and Sapphire Blue shades here. The Diamond Black is a must have shade for every eyeliner lover. It is a pretty black shade with subtle glitters (but it is not visible, you can see the shining only) and has creamy formula. The blue variants sapphire and Royal are also stunning blue shades, the sapphire is a dark navy blue and Royal blue is an ink blue shade. The applicator brush helps us to achieve the perfect eye line easily. As I said already it has an amazing staying power and I was wearing it almost ¾ of a day. It stayed on my eye lids very well without creasing and smudging. They say it will stay 36H and it might be true as per my guess and I cannot wear eyeliner for 36H without removing it. I use to rub my eyes often, but amazingly this stayed well on my eyes. I love the Diamond black shade very much and the next sapphire blue. All the shades have subtle glitters and they make the eyeliner shiny and bright. 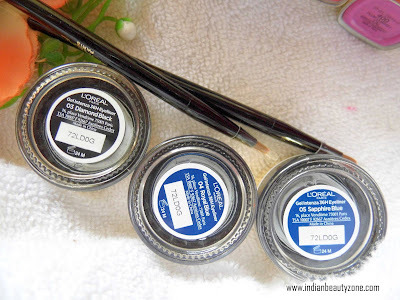 I am in love with the applicator and the silky smooth texture of the eyeliner cake. Overall it is worth for the price.